To help IT organizations transform their businesses and meet the increasing demands of their customers, Red Hat offers a dedicated support subscription for Red Hat OpenStack Platform. 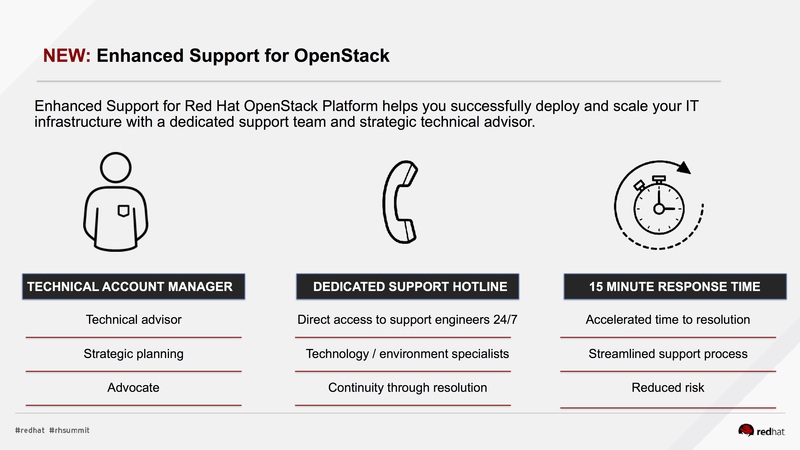 Enhanced Support for Red Hat OpenStack Platform delivers dedicated technical support and guidance that extends and strengthens your ability to deploy and manage cloud infrastructure. TAMs have deep industry knowledge and technical expertise to help your business successfully deploy new technologies and develop strategies to meet your business goals. A Dedicated Cloud TAM in your home country will work with you during business hours on strategic and tactical planning to maximize Red Hat OpenStack Platform as a part of your overall cloud solution. With a thorough understanding of your unique technical environment and goals, your TAM will provide guidance, share industry best practices, and advocate for accelerated fixes and future features on your behalf. A dedicated team of specialized engineers is reachable 24x7 through a direct phone line. If issues arise that affect your production environment, senior support professionals will collaborate and provide fast response and continuous engagement until resolved. By working closely with your Dedicated Cloud TAM, the support team is familiar with your environment and configurations, helping to streamline the troubleshooting process and accelerate the time to resolution. An extension of your operations team, your dedicated Red Hat support team will collaborate with you to share knowledge, solutions, and recommendations to maximize your staff’s understanding of OpenStack technology and enhance their skills. For production-impacting events (severity 1 and 2), a technical specialist will join a conference line within 15 minutes of the issue being reported to Red Hat. Our technical team will remain actively engaged with your team until a workaround or fix gets you back into production. This service includes dedicated support for Red Hat OpenStack Platform, as well as Red Hat Enterprise Linux, Red Hat CloudForms, and Red Hat Ceph Storage when used as part of the OpenStack solution. Standalone Red Hat Enterprise Linux, Red Hat CloudForms, and Red Hat Ceph Storage deployments are not covered under the Enhanced Support subscription. Number of cases For concurrent issues, you can prioritize the issue for which you want to receive Enhanced Support. Other issues will be covered under the premium support service-level agreement. For more information about Red Hat production support service-level agreements, please visit Production Support Terms of Service. To get started with Enhanced Support for Red Hat OpenStack Platform, contact your Red Hat Account Manager.